Plain old mead (made from honey and water, and known as a "show mead") is delicious. But it is often flavored with all sorts of other ingredients. After reading about all the different varieties of mead, I had to try making a bochet. Bochet is a mead that is made from boiled honey and has wonderful toffee and toasted marshmallow flavors. There is a recipe floating around the internet that is translated from French and allegedly dates back to the Late Middle Ages. The units of measurement are sesters, the definition of which seems to be debatable, so I had to improvise. There is a specialty market nearby called Super King, which has incredibly cheap produce and all sorts of products not found in typical grocery stores (such as halloumi cheese). We were able to find 5 lb. jars of honey at a decent price. We also picked up a large aluminum stock pot at another store. This was a bad choice, incidentally. We bought it because it was cheap but I've since learned stainless steel is the only way to go. You get what you pay for. A word about boiling honey--be very careful! It spatters like hot cooking oil and will increase to as much as three times its original volume unless stirred constantly. You will need to stir it continuously for at least an hour or two, so have an assistant available or else get ready to build your biceps. We cooled the honey by submerging the pot in ice water in the sink. Once it had reached a lukewarm temperature, we poured it to the primary and added spring water to make three gallons. The specific gravity was 1.112 and the pH was 3.4, which seemed appropriate. We also dissolved 3 crushed Campden tablets in some water and stirred that into the must. The Campden tablets were probably a bad idea, as I will explain in later posts. At the very least, they were unnecessary. Not only was the honey sterilized by the boiling process, but honey by default is very biologically stable. The sugars in honey are dehydrated and too highly concentrated for fermentation by yeast or bacteria. This is why honey has such an excellent shelf life. After allowing sufficient time for the sulfite to bind with the sugar, we hydrated a packet of Lalvin EC-1118. Unfortunately, I got distracted in the meantime and didn't end up pitching it for an hour. It's possible a significant percentage of the yeast population may have died off during that time. By this time, there had been no activity in the primary, which was unusual. 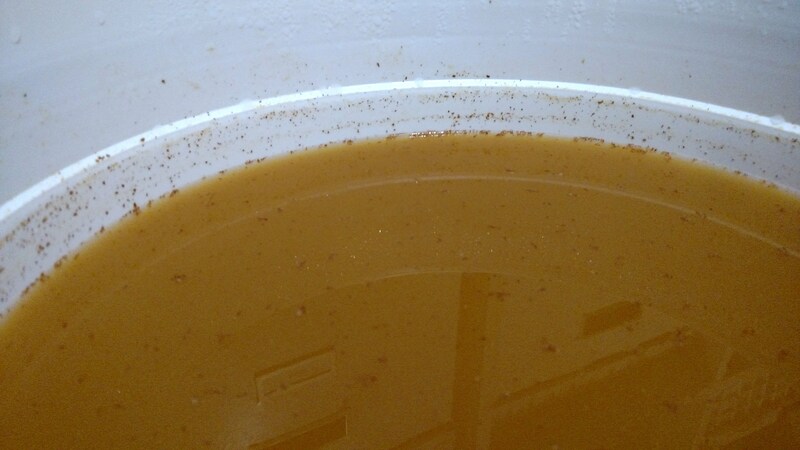 Typically, visible signs of fermentation will appear within 12 hours but this batch was completely still. I realized I had forgotten to add yeast nutrient and energizer, so I dissolved those in some water and added them. I also aerated the must by whipping it into a froth with a large industrial whisk. There was still no activity, so I prepared a new yeast starter solution (same strain--EC-1118). Something about the must was unfavorable to the yeast so this time, I gradually introduced small amounts of the must into the starter to help acclimate the yeast to it. I also aerated the must well before pitching the yeast. The fermentation still hadn't shown signs of activity so I considered the temperature of the house. It is winter after all and even in Southern California the house can get chilly at night. I moved the primary next to the wall heater to keep it warm at night. The airlock began bubbling slowly but slowed to a stop before long. I ordered a package of Uvaferm-43, a robust yeast strain selected for its exceptional ability to restart stuck fermentation. Unlike most yeasts, which are sold in powdered or liquid form, Uvaferm-43 is embedded in small alginate beads. The beads are suspended in the must, which flows into the alginate. The alcohol and CO2 flow out. Jed prepared it according to the instructions and it began bubbling for a while, but then stopped. There was something about this must that was prohibitive to fermentation. I remembered from brewing beer that the temperature must be carefully regulated. Above a certain temperature, the sugars will caramelize into a form that the yeast cannot metabolize. I was worried that perhaps we had the burner too hot while we were boiling the honey. The medieval recipe indicated it should be boiled in a cauldron over a fire, so it's anyone's guess what the proper temperature should be. I thought the honey might possibly be ruined so I bought some more. I added 18 lbs. of honey with spring water to make 5½ gallons. In hindsight, this was a huge mistake, as I'll explain later. I made another EC-1118 starter but that failed to take hold as well. The gravity at this point was off the hydrometer's scale. I estimated it was about 1.178. I bought an oxygenation kit online and an oxygen tank from Home Depot. By the time it arrived, there was a thin film of bubbles on the surface of the must. I pumped oxygen into it for 30 seconds and pitched yet another EC-1118 starter. The airlock has been bubbling for two days, although slowly. The gravity has changed by about 0.006 since adding the uncooked honey. Fermentation research indicated that 78 is the point at which biological stability occurs and fermentation cannot occur. This batch is probably at that point now, and several gotmead.com forum members recommended splitting it in two and diluting it. The gravity is 1.120. I added 5 tsp of yeast hulls and aerated it again but there is virtually no activity in the airlock. The gravity is 1.110 (about 9% ABV). The gravity is 1.106 (about 9.5% ABV). Further fermentation doesn't look possible without diluting the batch with water and adding more yeast. That should make the environment somewhat more hospitable to the yeast. I prepared two fresh starters of Premier Cuvée, since I had excellent results using that in my hibiscus mead (18%). After 15 minutes of hydration, I stirred in about a tablespoon and a half of the partially-fermented bochet and waited. After an hour, the starters were doing very well. Both had developed a cap of foam about an inch thick. I poured one into each primary fermenter and sealed the lids. The airlocks bubbled for a few minutes but then slowed to a stop. Still no activity in the airlocks. I unsealed the lids but left them sitting in place, in case the internal pressure was stressing out the yeast. Later in the day, I sealed the lids again to observe the airlocks. A few bubbles gradually escaped over the course of several minutes. I decided to leave the lids unsealed overnight. I sealed the lids and watched the airlocks. Very little activity. I may need to oxygenate it or add some yeast nutrient. The hydrometer now reads 1.064. This would translate to about 9% ABV. Fermentation continues, albeit slowly. I made two solutions of 3.5 tbsp of Yeastex and about 1/4 cup of water and added one to each primary. After stirring thoroughly, I oxygenated them for about a minute each. I finally racked the bochet into two 3-gallon secondaries. I hope sitting in the primary for half a year hasn't affected it. I don't taste any plastic flavors. Adding the two differences yields a total change of 0.1095, or 14.5% ABV. Since the medieval recipe mentioned the optional addition of ginger, long pepper, grains of paradise, and cloves, I purchased some of these ingredients. I managed to find long pepper at Whole Foods, surprisingly enough, but grains of paradise could only be found on the internet. I put each spice in an empty 8 oz. bottle and then filled them halfway with Everclear neutral spirits, to extract the flavor. Once they have steeped for a sufficient amount of time, I'll do some taste tests and add the appropriate amount of extract to the bochet. This way, it will be much easier to control the flavor than it would if I steeped the spices directly in the bochet itself. One can always add more of an ingredient but once added, it can't be removed. While I was fining some of our other wines, I drew off a small sample of bochet for tasting. It's a delicious dessert wine with strong notes of chocolate and toffee. I added a splash of the vanilla bean extract I've been steeping for the past several months and the bochet started to taste like Coca Cola. I added the same quantity of long pepper extract and grains of paradise extract--big mistake! Those two extracts are potent! The glass of bochet now tasted as if I had stirred a spoonful of ground black pepper into it. We'll definitely have to use these flavors sparingly, if we decide to use them at all. Jed says we should be conservative with the vanilla extract as well. After all, the primary flavor is toasted honey and we don't want to mask that. We ended up flavoring the bochet with the extracts and bottling it but it was probably late at night because I don't seem to have notes. The finished product is delicious but very rich and sugary--not something to be quaffed in great quantities. Since we had about 30 bottles, we gave several of them to friends and family as Christmas gifts. FedEx smashed one of these in a warehouse in Tennessee and refused to honor the insurance claim, so I still owe my mom a bottle.